Love the cosies happy Easter! Have a really lovely Easter weekend Susan with all your family. 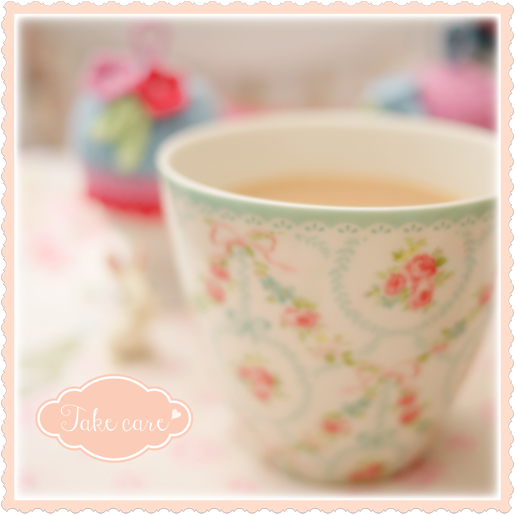 The cosies are beautiful in the spring colours and with the lovely scalloped edges and floral details. Happy Easter to you and your family, Susan. Very pretty & I like the little rabbit. Have a lovely Easter. Those egg cozies are the prettiest i've seen. Lovely as always. Enjoy your time with your family. That tiny bunny is so cute . Hope you all have a lovely weekend . Have a wonderful Easter with your lovely family, Susan! Those cosies are so cute, the flowers so tiny. You are clever. Hope you and yours have a great Easter. A very special time for you with your daughters home for the Easter break. Gorgeous little cosies - such beautiful work. Lovely! Soft boiled eggs are a regular breakfast happening in this family and these little cosies are just perfect! Wishing you and yours a beautiful Easter! Such sweet cosies, they really are adorable! I love the pretty colours and the cute little flowers! Wishing you and your family a very Happy Easter, dear Susan! What a sweet and pretty post! 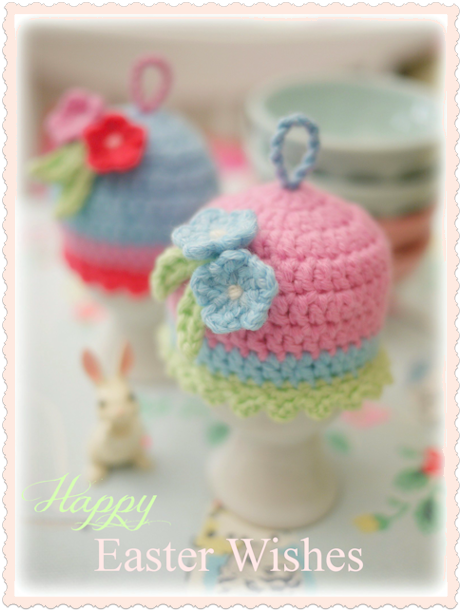 Those egg cozies are outrageously adorable!! I'm eggs-cited about the drawing! Crossing my fingers and toes. Everything is so lovely!!!! I love your adorable crochet egg cosies! The little flowers are stunning! Happy Easter for you and for all your family!!! Your egg cozies are beautiful. I adore the colors. Happy Easter to you and your family. The colours, the cosies, the bunny....all lovely. Happy Easter to you as well, and thanks for sharing these wonderful pics! What sweet little cosies Susan, I love them! 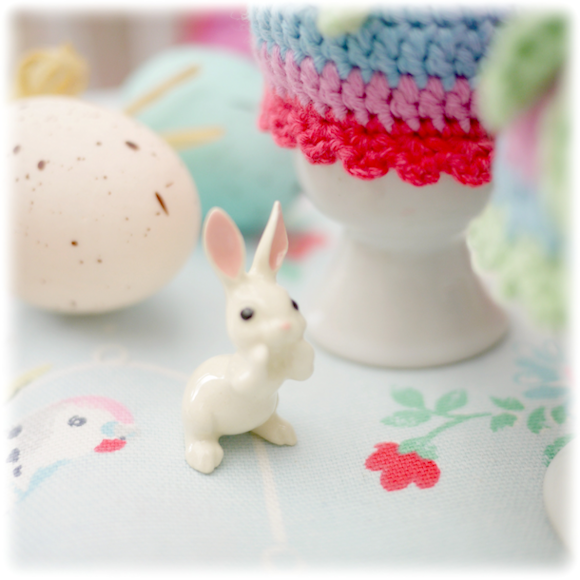 :) I'm also very taken with the teeny tiny Easter bunny!! Have a wonderful Easter weekend with your family. 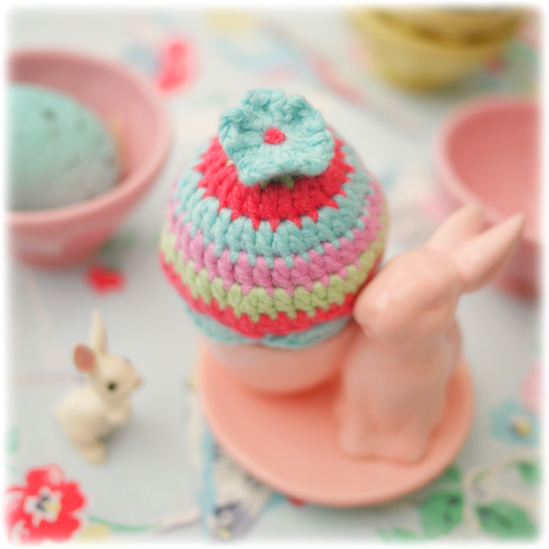 Oh, my goodness...the cutest and prettiest egg cozies! Happy Easter, Susan. love, ♥ love, ♥ love ♥ the cosies...almost tempts me to crochet again...well, almost! Happy easter dear Susan! 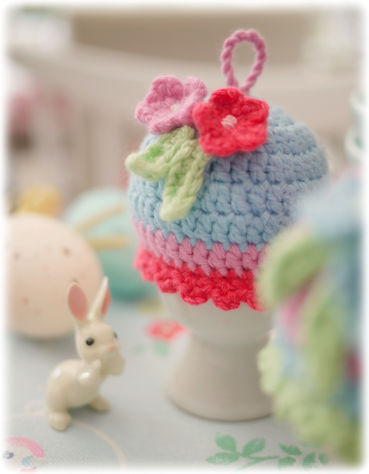 Your egg cozies are gorgeous - with all the pretty details! So nice for an easter breakfast table! Have a sweet time with your family! Love the egg-cosies!! Happy Easter! 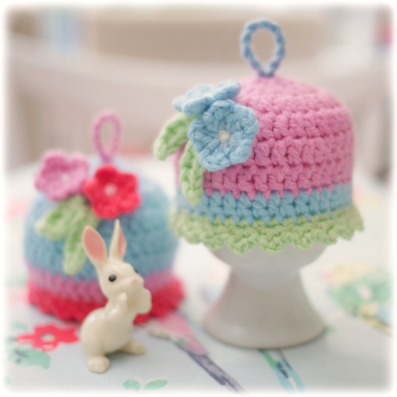 Love those little Easter cosies, so very cute and pretty! Isn't this a splendid time of year? As a child I was much more in love with Christmas - but as an adult I revel in Easter! Enjoy your time with with your daughters dear Susan. Oh my... that pink, blue and green one is sooo pretty! Thanks for always making my heart sing with your gorgeous photos! Happy Easter Susan!!! I like the loveliness in this post. They are always so beautiful. Oh you darling heart, YOU! Thank you for coming to my current post, Susan....and I hope you had a lovely Easter? OUR DAY WAS GORGEOUS! The sun was out, it was warm, we went to the lake to walk and then another walk in the afternoon...I even started to putter in my garden! It was therapeutic! 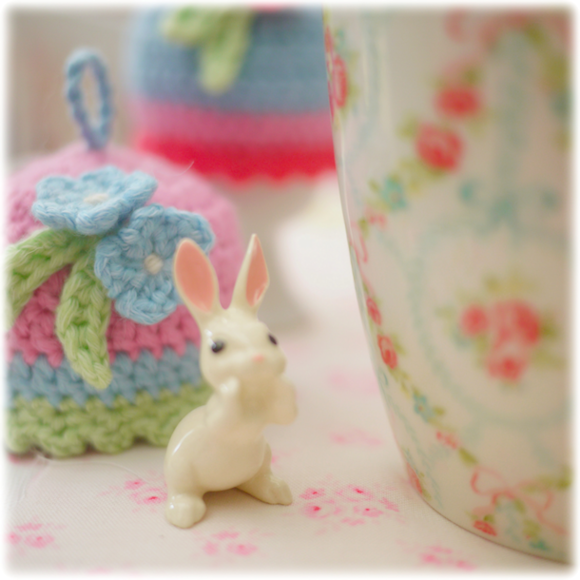 Beautiful little cosies and bunnies - and you always use such lovely colours. How is the Aran knit coming along? I hope that you all are having a wonderful, peaceful Easter break - and that the Easter Bunny was generous with the chocolate! But here at last! hehe.. Here's hoping Easter was lovely for you and your girls.. I had fledglings home too and being together again was so very special..
LOVE all the prettiness I always find here in your little corner of blog land..
And of course and huge THANK YOU for kindest visits always..
Oh my stars these are precious! I would never get to my egg because I would never want to take off the warmer!! :). These are beautiful and I'll be pinning them to my inspiration board. Thank you so much for sharing these beauties with all of us!! !